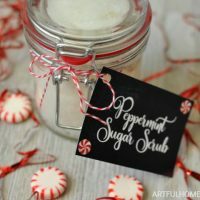 Peppermint sugar scrub is so easy to make! 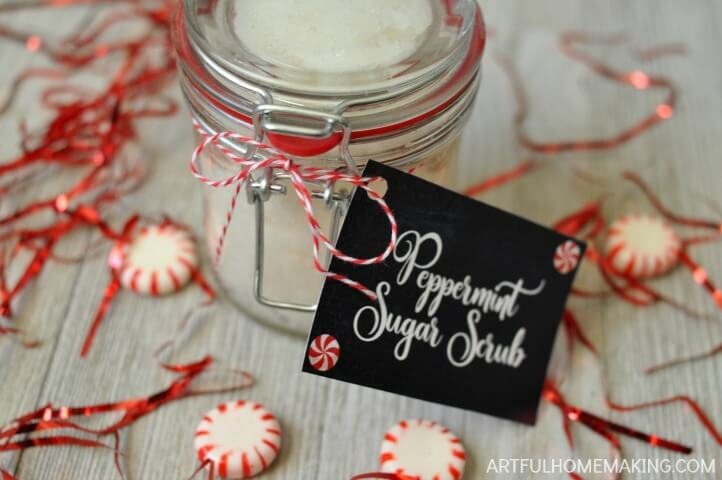 Here’s how you can make your own DIY peppermint sugar scrub. 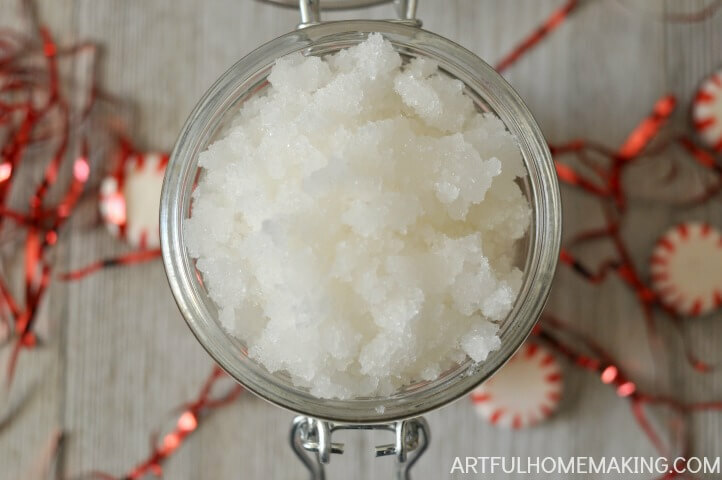 After making my own sugar scrub several years ago, I realized how incredibly simple sugar scrub is to make! 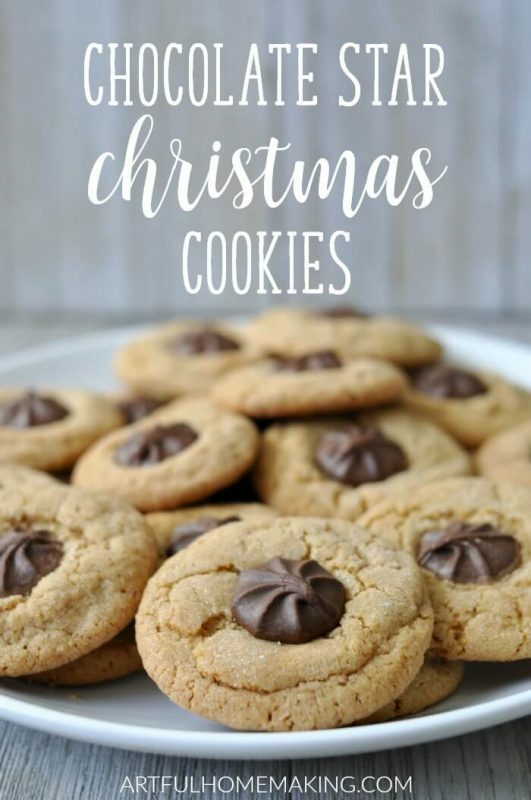 With just 3 simple ingredients (that you probably already have in your pantry), you can have a homemade gift ready in just a few minutes! And, it’s a clutter-free gift! 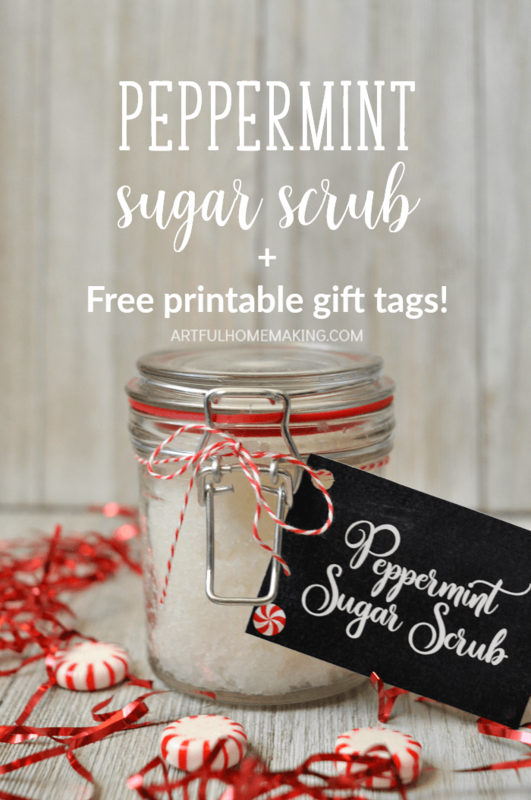 If you have a friend who likes natural skincare products, this handmade sugar scrub might be the perfect gift idea! This couldn’t be simpler to make! If your coconut oil is solid, melt it in the microwave or on the stove top. Don’t let it boil or get too hot, you just want it melted. Add the cup of sugar to the bowl of melted coconut oil, and stir to mix it all together. Add 10-15 drops of peppermint essential oil (I use 15 drops) and mix well. Place the completed sugar scrub into a jar, and you’re done! I found this cute glass jar at a local store, but these jars are similar. 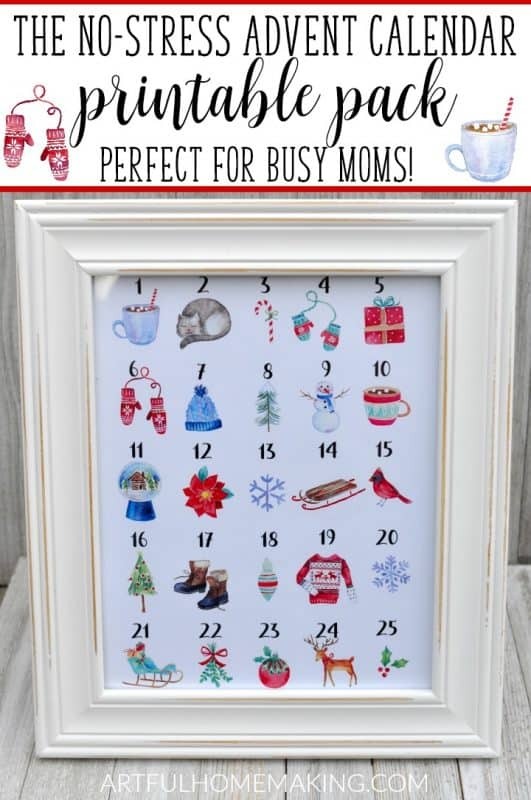 Don’t forget your free printable gift tags! Download the printable tags here. I used some red and white baker’s twine to tie my gift tags onto the jar. I love how festive the baker’s twine makes it look! 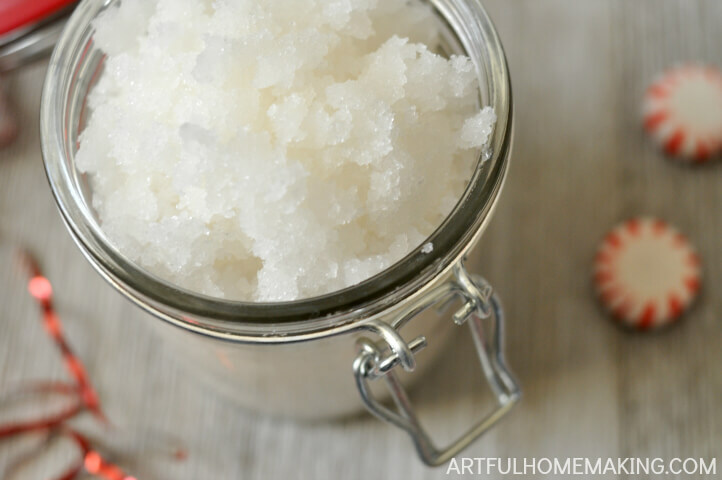 This is a super easy and fun-to-make sugar scrub recipe! 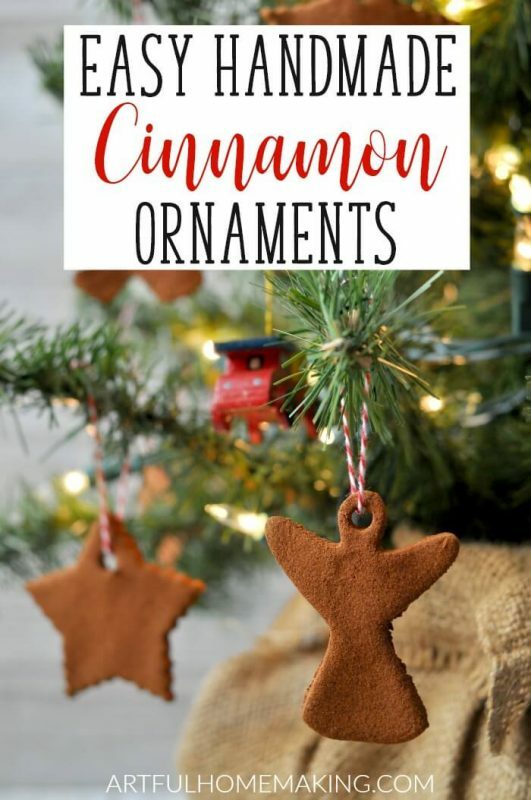 It's the perfect homemade gift. If your coconut oil is solid, melt it in the microwave or on the stove top. Don't let it boil or get too hot, you just want it melted. Place the completed sugar scrub into a jar or other container. Tie with baker's twine, add the free printable label (from the original blog post), and you're done! This is another recipe that’s very kid-friendly and a great one to have them help you make! This would make a perfect gift! Thanks for sharing at Party in Your PJs!